Super Savings Item! 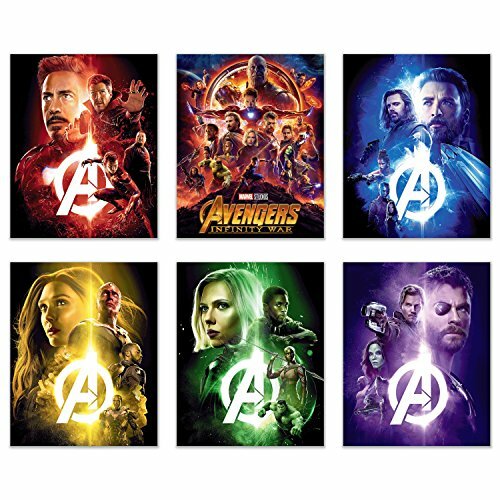 Save 32% on the Avengers Infinity War Movie Poster Prints 8x10 - Set of Six Wall Art Photos - Black Panther - Iron Man - Captain America - Doctor Strange - Spiderman - Wong - Thor - Star Lord - Gamora - by Crystal at HoldUp Art. MPN: 43237-2. Hurry! Limited time offer. Offer valid only while supplies last. Avengers Infinity War Movie Poster Prints 8x10 - Set of Six Wall Art Photos This is a pack of six unframed 8x10 prints on glossy photo paper. Prepare for the most ambitious crossover event in history with these beautiful photo prints of your favourite Marvel Avengers. Decorate any geek sanctuary with these high quality photo prints and get your popcorn ready to see a movie that will cause tremors across the multiverse! Professional Quality Photographs and Prints at GREAT Prices Our photos are developed on 100 year archival premium-grade paper in a rich gloss finish. Make a purchase with confidence; your happiness and security is made a top priority as we back each set of prints with a 30 days no questions asked refund. All of our print orders are processed by Amazon and come with FREE, two-day, Amazon Prime shipping. READY TO FRAME: Choose your own style to match your room decor. Prepare for the most ambitious crossover event in history with these beautiful photo prints of your favourite Marvel Avengers. HIGHEST QUALITY PRINTS: Made with the finest quality inks and papers. MONEY BACK GUARANTEE: If you are unsatisfied with your purchase for any reason, simply return your product within 30 days for a no questions asked refund.